Comprehensive information about Gopabandhu Das including biographical information, facts, literary works, and more. Gopabandhu Dash, known as Utkalamani (Gem of Odisha ), was a social worker, reformer, political activist, journalist, poet and essayist. Gopabandhu Das is one of the founders of the modern Orissa state, is also remembered for his patriotic lyrical poems and lucid, thought provoking prose writings. This educational Gopabandhu Das resource has information about the author's life, works, quotations, articles and essays, and more. 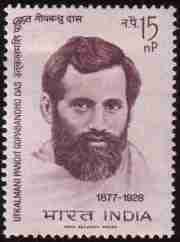 Articles about Gopabandhu Das or articles that mention Gopabandhu Das. Here are a few random quotes by Gopabandhu Das.